HYATTSVILLE, Md. (CNS) — The meeting room in the middle of Maryland’s most immigrant-dense ZIP code Nov. 20 was full of people who epitomize the problems President Barack Obama is trying to address with executive action. Families with roots in Mexico, El Salvador and Guatemala — some with U.S. citizen children, some with one adult child who has legal permanent residency (a green card), and other adults who are in the country illegally — all watched the big screen as Obama announced his plans for allowing perhaps 40 percent of the 11 million people without legal immigration status to be temporarily protected from deportation. The package of administrative actions — explained in more detail starting with an Obama appearance Nov. 21 in Nevada — includes reprioritizing who the government will target for deportation, cracking down primarily on dangerous criminals and new arrivals at the border. Another component will change the approach in granting visas to foreign students in science and technology who want to remain in the U.S. after graduation, according to the White House. That’s the sort of thing that Carlos Velasquez said is so helpful about the president’s actions. Velasquez, attending the Hyattsville viewing party with other members of St. Camillus Church in nearby Silver Spring, where he is active in a variety of ministries, said he knows many, many families who will potentially benefit from the extension of deferred action to new segments of the population. The simple step of having a Social Security number will make it possible for some of his friends to finally buy homes, Velasquez said. They have the financial resources and pay taxes using an identification number from the Internal Revenue Service, he explained, but lacking a Social Security number is an obstacle to obtaining a mortgage. Obama’s orders basically would expand upon the 2-year-old program known as Deferred Action for Childhood Immigrants, or DACA. Through it, more than half a million young adults and teens who came to the U.S. as minors have been promised they won’t be deported if they stay out of trouble. In exchange for registering with the government, going through background checks and other requirements and paying fees, they received work permits and Social Security numbers. More than 600,000 people have applied for the program launched in summer 2012. Of that, 27,000 applications were rejected (and could perhaps be resubmitted) and about 16,000 have been denied. Others are in various stages of the approval process. The new program would offer the same deal to parents of U.S. citizens or green card holders who have lived in here for at least five years, a potential pool of more than 4 million people, according to the White House. Both the parents-of-citizens program and DACA will now be good for three years, and renewable. The administration officials said they estimate about 270,000 additional people will be eligible for DACA under new rules that drop the previous age limit of under-30 and roll forward the date by which applicants need to have arrived in the U.S. to 2010 from the original date of 2007. 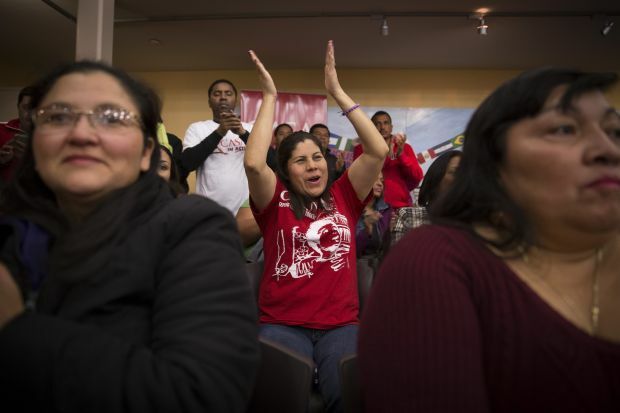 Though the audience at the offices of CASA de Maryland, a community organizing service, was quiet throughout the 15-minute address, broadcast with simultaneous Spanish translation on Telemundo, the moments leading up to the president’s appearance were filled with cheerful chanting and applause as residents of the neighborhood stood to tell their stories. “Si, se pudo!” they chanted, or “yes, we could,” or maybe “yes, he could.” That’s the past tense of the “si, se puede” or “yes, we can,” that has long been popular in rallying migrants to various causes. Among those who were quick to applaud the president’s plans were, Archbishop Joseph E. Kurtz of Louisville, Kentucky, president of the U.S. Conference of Catholic Bishops, and Seattle Auxiliary Bishop Eusebio L. Elizondo, chairman of the USCCB Committee on Migration. “We welcome any efforts … that protect individuals and protect and reunite families and vulnerable children,” said Bishop Elizondo in a statement from the USCCB. The Catholic Legal Immigration Network, known as CLINIC, also welcomed the package of executive actions, including plans to make it easier for immigrants who lack legal status to travel to their home countries without penalty. They are not undocumented they are illegal. The Church should be addressing the problems in South America to make those countries livable and not with liberation theology ( that is only atheistic communism with a religious veneer ). You better reassess your statement about benefitting millions as it will bury millions who are citizens. Socialism has NEVER WORKED I suggest you look at where it has been attempted. Millions dead because you have to “break a few eggs to get an omelet”. All those eggs were living human beings. Where are the Mindzenty’s when the Church needs them. There will always be inequalities in income but that does not mean cruelty and deprivation as it is with socialism. This unilateral decision by the president is not something to cheer about because it will further divide the country and result in class warfare. Also the decision seems more political in nature since there was no reason to rush into this and take unilateral action, as if this issue was critical and a priority to the country, which it is not per the recent elections. The real reason seems political. Also the president’s unilateral action shows that he really is not interested in compromise and working together. The proper course of action by the president should have been to follow the law and let the new Congress forge a bipartisan bill that they would send to him for his signature. Instead the president decided to act alone and against the will of the people. As if he were a king instead of an elected president.